Spring is here… and so is your birthday! Get ready to bask in these gorgeous spa products designed just for you, April baby. The April Birthstone collection takes inspiration from your stone, the Diamond. A symbol of lasting love and friendship, diamonds are the stone of choice for weddings and anniversaries. To pay tribute to your special day, we created an original fragrance with notes of grapefruit peel, Australian Sandalwood and delicate jasmine. The end result is elegant and unforgettable. Dip into a decadent bath loaded with skin-moisturizing goodness! This birthday indulge with the Diamond Bath Bomb, created just for your special day. Shaped like a diamond and dusted with iridescent glitter, this is a must have for any bath. Simply lower the lights, fill your tub with steamy water and slip into a brand new year. Sparkle like a queen with a hidden gift inside! Each item in our Birthstone Collection features a dazzling Fragrant Jewels’ ring with a bright CZ center stone. There are 10 rings in all – and one of them is a rare teardrop-shaped ring with a brilliant clear CZ center stone. 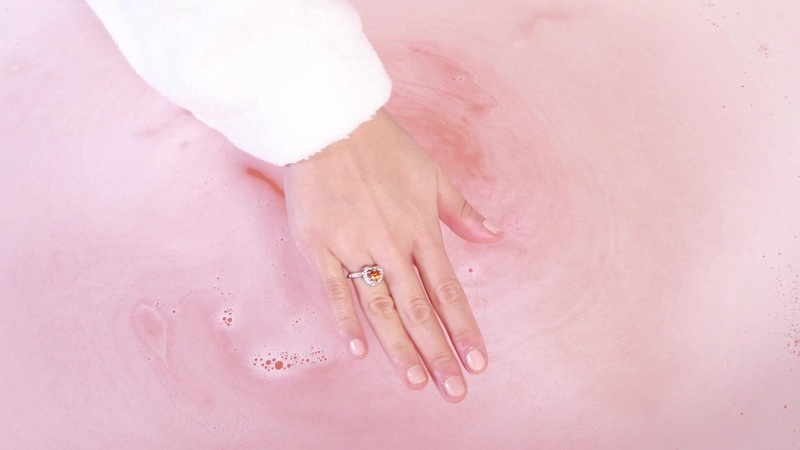 Free Bonus Each Bath Bomb contains a beautiful LIMITED EDITION ring and a code that gives you a chance to win a ring with a retail value between $100 and $10,000!